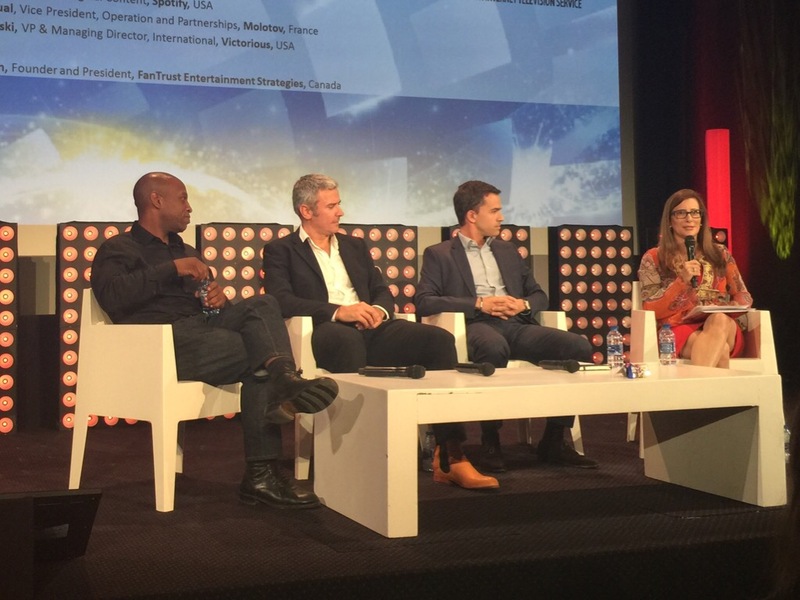 Expect plenty of talk about the world of over-the-top (OTT) video streaming at MIPCOM this year, with a barrage of platforms and content competing for viewers’ attention. This morning, three back-t0-back sessions explored the disruption going on in this space. 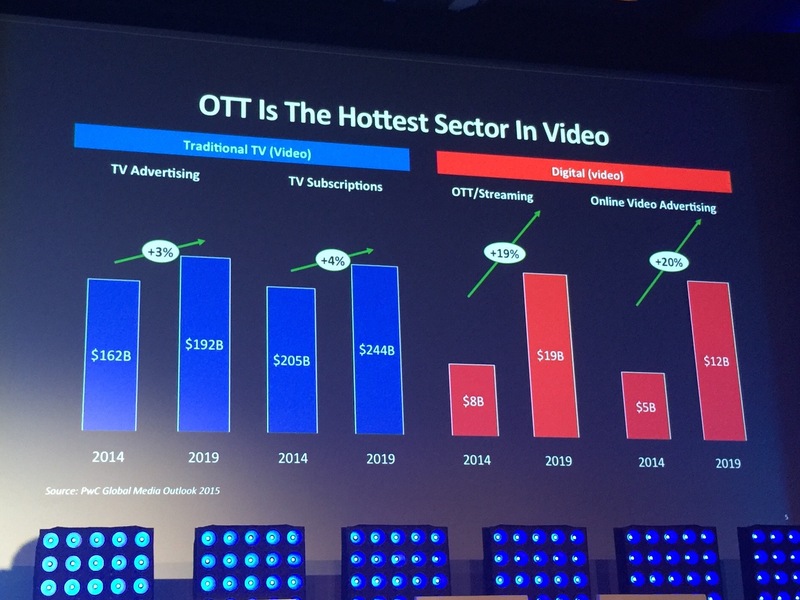 It started with PwC’s Christopher Vollmer delivering a brisk run-through of some of his company’s research and predictions for the OTT market. 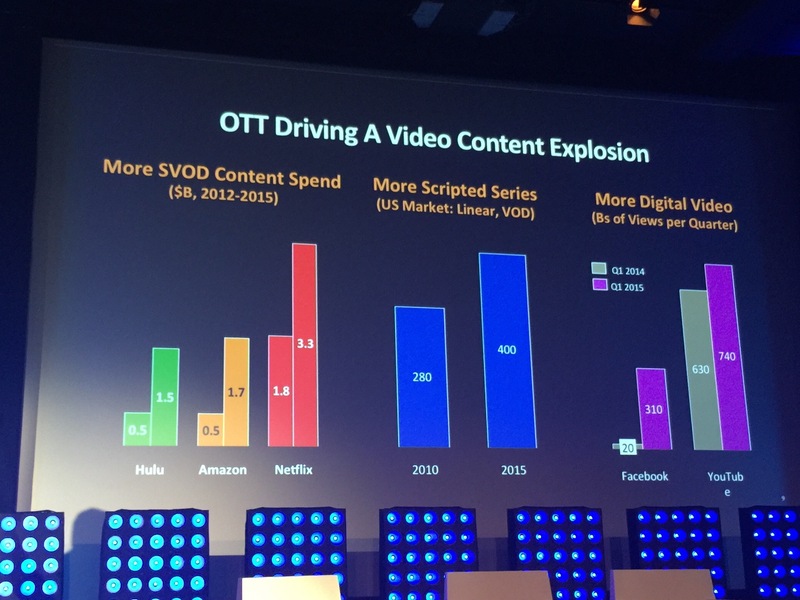 “There’s probably never been more demand for video content. There’s also never been more competition for consumer time and attention. There’s also been never more diversity in the video ecosystem in terms of how to get that video, where to get it from, how to experience it,” he said. He noted new flavours in OTT, from the subscription video-on-demand market dominated by Netflix, Hulu and Amazon; the similar services launched by pay-TV operators; the advertising video-on-demand space epitomised by YouTube; and also channels and networks going direct to users like the WWE Network, HBO Now and Starz Play. That includes consumer behaviour, including binge-viewing, and a change in the kind of content being watched by children: “a good indicator for where the market might be going in the coming years… their consumption is still weighted towards traditional viewing, but their preference is moving towards streaming,” said Vollmer. “Television is not just movies and TV series, but it’s right next to games, right next to shopping, right next to social media, photos, personal videos, a whole bunch of things competing for consumer time and attention… How as a television-focused brand or player, whether you’re a network or a player, how do you compete to be relevant in that kind of environment?” he continued. 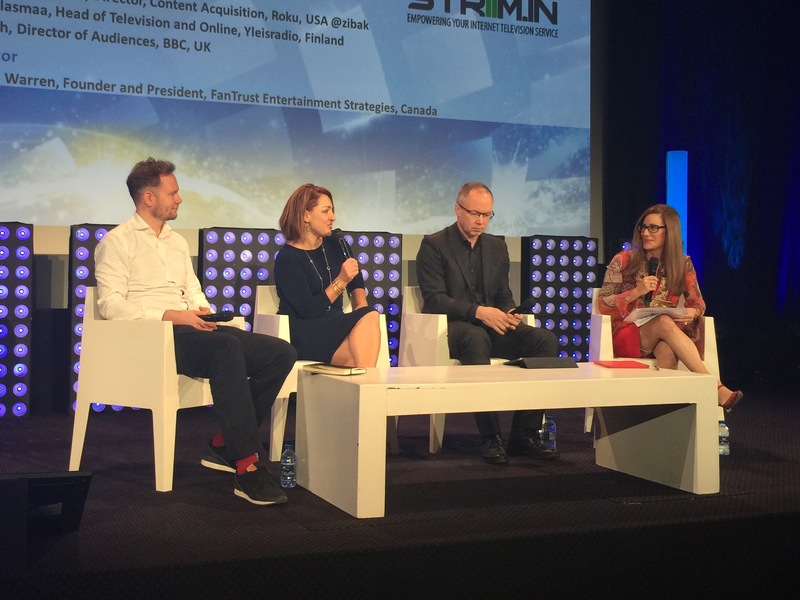 Next up was the ‘Broadcast: Simple as an App‘ session, exploring the way broadcasters are launching their own standalone, direct-to-consumer services – often delivered through apps – that sit alongside the bigger players in the OTT world like Netflix. 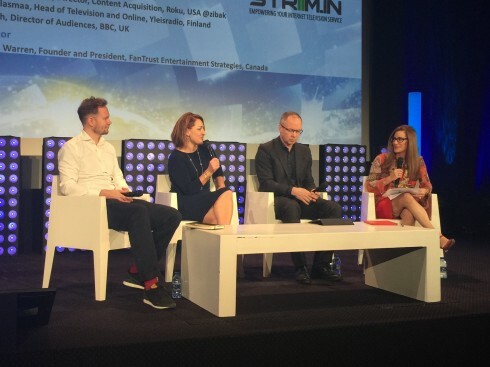 The speakers were Roku’s director of content acquisition Ziba Kaboli-Gerbrands; Yleisradio’s head of television and online Risto Kuulasmaa; and the BBC’s director of audiences Nick North. FanTrust Entertainment Strategies’ Catherine Warren moderated. Kaboli-Gerbrands said that Roku doesn’t have its own channel store: “We don’t have an iTunes or Amazon Prime, so that helps us maintain a Switzerland-type [neutral]setting,” she said, noting that Roku sees a lot of broadcast channels going over-the-top with their own direct-to-consumer apps. Roku is trying to help those apps get discovered by viewers. The BBC is using this knowledge outside TV: for example, giving its Radio 1 radio station a presence on its iPlayer video service, as well as YouTube, based on its understanding that Radio 1’s youthful audience is moving to those platforms in great numbers. Kuulasmaa talked about Yleisradio’s plans to move into podcasts, as well as user-generated content through a new platform that will “give the old media into the use of the new-generation creators” through vlogging and other UGC videos. Warren asked North about how the BBC plans to take its shows beyond the UK to the rest of the world. “We have a big change program going on, myBBC, which is building the sign-in functionality, building customisation, personalisation, personalised recommendations, opening up a new way for a more interactive relationship with the audience,” he said. Initially this will focus on British licence-fee payers, who’ll be able to use their devices to access BBC content while abroad. 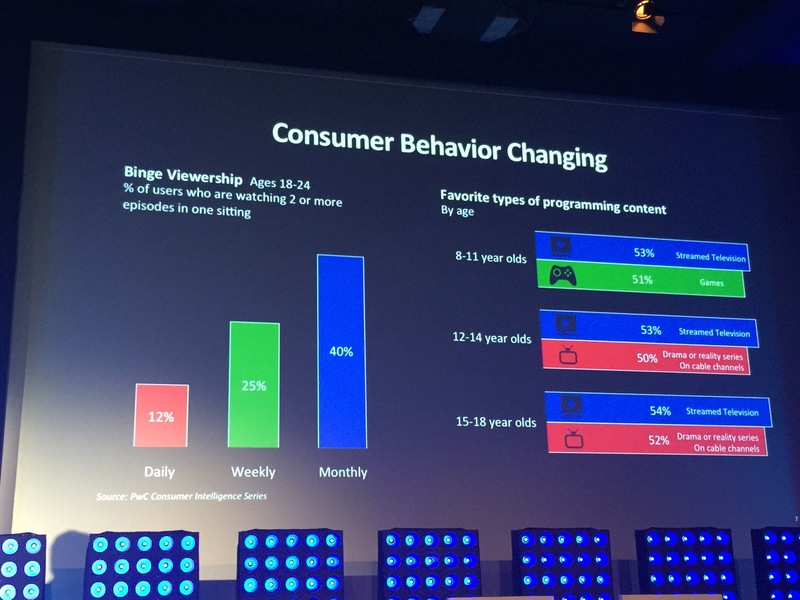 Kuulasmaa talked about new content formats: Yleisradio already shows e-sports – people playing video games competitively for an audience – as it shifts “from the broadcaster to a deepcaster – personalising your experience”. And that includes a move towards a world where as a viewer “you are curating your own feed” rather than being tied to a schedule, or even just picking individual shows to watch on-demand. North finished off by talking about multi-screen behaviour. “It’s evident that there is a great deal of multi-screening happening today, and we expect that to grow. When we look at our iPlayer stats, we see the biggest growth being iPlayer through TVs – watched through the TV screen… that is where the growth lies for video, on the big screen,” said North. 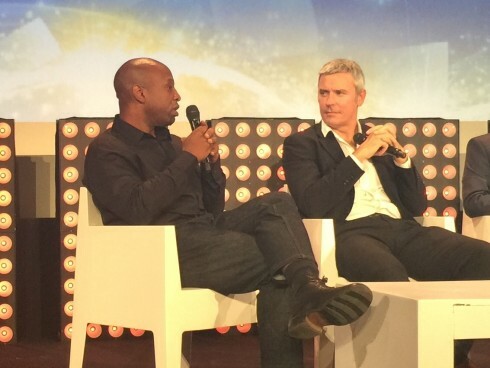 The third session delivered a trio of “new disrupters” in this space: Spotify’s global head of original content Matt Baxter; Molotov’s VP of operation and partnerships Jean-Marc Denoual; and Victorious’ VP and managing director, International Tony Zameczkowski. Warren moderated again. Spotify’s Baxter spoke first, about the 75m people who use Spotify, and the role it plays for them. 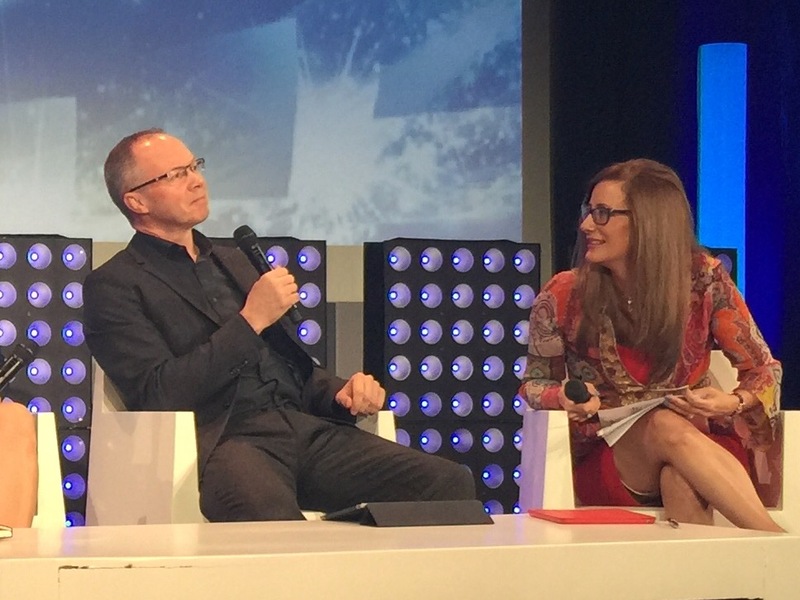 “The past 20 years of the music industry have been all about disruption. Our mission at Spotify with the original content initiative is to look at the deep data we have on our audience base, and start to program that with deep diversity of content… We’re not just a utility, we’re part of the ritualised experience of their life,” he said. Zameczkowski talked about Victorious, which aims to help creators, celebrities and media companies to build apps to foster their “superfan audiences”. He explained how the company differentiates itself for those clients. “YouTube is addressing a broad fanbase, but Victorious is embracing the superfan communities,” he said. Victorious’ apps include plenty of video: messages from YouTube creators to their fans, for example. Baxter joined Spotify from BuzzFeed: has he brought models and lessons from that world to his new role? “The biggest thing that I learned is just that making sure you create content that’s applicable for the platform, and I think that’s what we’re doing now for Spotify. In the industry you have a lot of people coming from the traditional TV world and trying to create content with a traditional three-act structure and designed for a lean-back experience,” he said. Baxter talked about the difference between platforms. “On YouTube it’s typically more about information and cute cats, whereas on Facebook it’s about content that identifies with your specific experience… so it’s taking the lessons of the specific touchpoint and creating content based on that touchpoint,” he said. “Spotify is a rambunctious teenager who’s getting ready for college right now. Kinda set in his ways but also hoping for new experiences,” he said, describing the company’s “pivot” with its original content initiative.